There’s no denying the impressive impact of sports tourism these days; destinations are taking their sports inventories to the next level. These herculean sports venues, or what we like to call megacilities, have generated an estimated combined economic impact of more than $200 million to date. They open their doors to competitions of all calibers where players, coaches and spectators alike will have to pick up their jaws from the state-of-the-art floors and fields. Game changing facilities generating staggering economic impacts. Here’s the lineup of what Sports Planning Guide has officially coined as megacilities. Spooky Nook Sports was funded privately by its owner, Sam Beiler, for approximately $11.25 million. After traveling for his daughter’s various sports tournaments across the country, the family decided to create an indoor facility that offers quality customer service, ideal playing and spectator conditions and additional activities during downtime. The nation’s largest indoor sports complex comprises more than 700,000 square feet under one roof. It offers 10 hardwood basketball courts, six tennis courts, four field hockey courts, 10 volleyball courts and six soccer fields, as well as a full-sized baseball infield and batting cage area. Its outdoor component features a water-based turf field and climate-controlled dome (one of only two of its kind in the world.) Other amenities include a 10,000-square-foot fitness center, climbing center, Clip n’ Climb (the only one of its kind in the nation), meeting and banquet spaces, a food court and arcade. Spooky Nook Sports has an on-site hotel, The Warehouse Hotel, with 135 guest rooms and a 175-seat restaurant and bar, Forklift and Palate Restaurant. For volleyball, Spooky Nook’s top events are Martin Luther King (MLK) Kickoff Classic, which takes place in January, and Irish Rumble, which takes place in March. Blue Chip USA Invitational from July 5-8 is the main event for girls’ basketball, and Hoop Group’s Summer Jam Fest in July is the facility’s top boys’ basketball event. With forecasted attendance of over 925,000 in 2015, Spooky Nook Sports continues to see strong growth and has created more than 400 jobs. In 2014, Spooky Nook contributed more than 10,000 room nights to area hotels and made a positive economic impact throughout Lancaster County and the surrounding community. Hotels, restaurants and area shops reported double-digit growth during peak times of the year in terms of traffic and revenue. 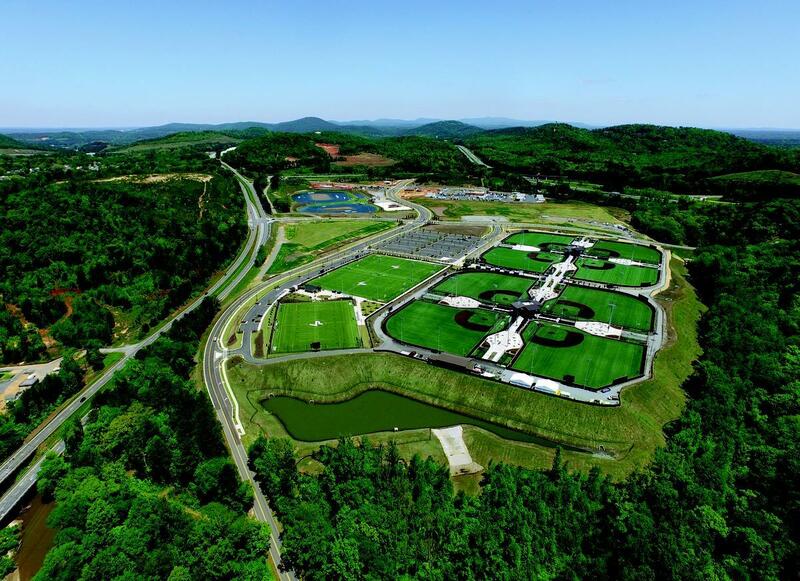 LakePoint Sporting Community was privately funded until it received a $32-million bond to support the next development phase: the indoor facility. Currently, LakePoint’s South Campus offers eight baseball fields, 16 batting cages, three soccer fields, three lacrosse fields, three football fields, 10 sand volleyball courts and Terminus Wake Park, the nation’s largest cable wake park that allows for towed water sports without boats. On site there is an open-air pavilion, two 360-degree scout towers, fast-food restaurants, a baseball mini-mall and a Hampton Inn. With more than 1,300 acres nestled in the foothills of the North Georgia Mountains and adjacent to Lake Allatoona, LakePoint will feature five million square feet of sports venues and amenities including on-site hotels, restaurants, themed retail, bowling and ziplines. The indoor facility will be the next major economic development driver, allowing LakePoint to host a number of indoor sports including basketball, volleyball, wrestling, cheerleading and dance year round. Major events LakePoint hosts are the World Woodbat Tournament (baseball), The Triple Crown Oct. 18-19, 2015 (wakeboarding) and 2016 Atlantic Sun Conference Championship (volleyball). Currently yielding over one million visitors in its first year, LakePoint is on track to be one of the world’s largest destinations for travel sports. To date, LakePoint’s economic impact is $80 million in direct spending, $5.75 million in taxes and 1,500 jobs created. The average non-resident spends $122.15 per night, at a rate of a 14-person party size. The local community has seen a 10 percent year-on-year profit increase as a direct result of “The LakePoint Effect.” For instance, in its first week of opening, a National Quick Service Restaurant served more than 3,000 customers. Upon completion of the indoor facility, the local community will see a rise in jobs, up to 200, and in visitor traffic, up to one million. Round Rock Sports Center was funded by revenue bonds, city self-financing and hotel occupancy taxes for a total of $14.9 million. Round Rock Sports Center spans 82,800 square feet of indoor space with 47,775 square feet of flexible, open space. Several configurations are available, including six high school basketball courts, 12 high school volleyball courts or three NCAA basketball courts. Other amenities include ceiling-mounted basketball goals; divider curtains; Bio-Cushion Classic maple flooring system; HD video wall for displaying brackets, promotional videos or live sporting events; 12 60-inch LCD scoreboard displays programmable by court or linkable by sport; upper-level, VIP-style spectator seating; a training room, tournament room, players’ lounge and referees’ lounge; three multipurpose rooms that can be subdivided into nine; and a concession service and seating area. There is seating for over 1,400 with a capacity of 3,053, and over 500 parking spots. In addition to its indoor features, Round Rock Sports Center has a covered pavilion with a multi-sport turf surface, playground, concession area and restrooms, and an open-air plaza with a play area and tailgating area. The center’s most notable events are Heart of Texas National Qualifier Wrestling, Joola National Table Tennis Tour and Austin Juniors Tour of Texas Power League Qualifier, which was hosted five days after the doors first opened and was the largest event Round Rock has hosted in terms of number of teams and spectators. Round Rock Sports Center had seen 105,000 participants and 180,000 guests as of June 27, 2015. Grand Park was municipally funded and received $45 million to create the venue. Spanning more than 400 acres, Grand Park offers a total of 31 multipurpose fields, 120 by 90 yards each. Seven fields are synthetic, eight are lighted and two are stadium fields. The park also features 26 baseball/softball diamonds, eight of which are synthetic (four full-size and four junior-size). All diamonds have bleacher seating. Other amenities include seven concession stands with restrooms, state-of-the-art irrigation and drainage for rain play, 3,500 parking spaces and two 6,000-square-foot operations buildings. A 370,000-square-foot indoor facility set to open July 1, 2016 will house three full-size multipurpose fields, 115 by 75 yards each, with space for spectators. The facility will also include a 45,000-square-foot warm-up area, 30,000-square-foot mezzanine concourse for spectator viewing, a 3,500-square-foot meeting room, 1,500 square feet of additional meeting space, and food and beverage services. Grand Park hosts a wide variety of sporting events—both big and small. Top events include National Cup Championship (soccer), US Soccer Regional Championships and Baseball Youth National Championships. Grand Park is expecting 1.2 million visitors by the end of 2015. In 2014, the park saw 510,000 visitors from 48 contiguous states and Canada, and the direct, visitor-generated economic impact totaled $43 million. Nathan Benderson Park (NPB), owned by Sarasota County, was funded through a public-private partnership. A portion of the public funding came from tourist development tax funding. The total cost to date is $35 million. NPB began hosting events in 2009, but was officially opened to the public as a county park in 2014. The 600-acre park comprises a 400-acre lake and a 2,000-meter sprint rowing course. Amenities include coaching lanes, a wave attenuation system, starting huts and grandstands. The lake’s perimeter is just over five kilometers and features a 15-foot-wide paved path. Regatta Island is the 30-acre event epicenter in addition to an athlete village, vendor village, boat launch, event headquarters, hospitality tent, ample parking and spectator viewing. Construction for a permanent finishing tower broke ground in August 2015. Major upcoming events to be hosted at Nathan Benderson Park include the 2016 USRowing Olympic Trials, 2017 World Rowing Championships and 2018 NCAA DI-DII Women’s Rowing Championships. In the past year, NBP has generated $26.8 million in direct economic impact to the region and has filled 22,600 hotel room nights. This impact was generated from 33 events including regattas, stand-up paddleboard races, dragon boat races, a Pentathlon World Cup, triathlons, 5k races, and 31 different collegiate and club training sessions. The $22-million project was funded through a joint venture agreement by the City of Gatlinburg (70 percent) and Sevier County (30 percent). Rocky Top Sports World is an indoor/outdoor, multipurpose venue. The outdoor space features seven outdoor fields (six are synthetic turf and six are fully lighted) and its Championship Stadium field; the space is configurable for 13 youth soccer fields. Ample parking, bleacher seating, restrooms, picnic tables and a children’s play area round out Rocky Top’s outdoor offerings. The Rock is the name of its 86,000-square-foot indoor facility, which offers six hardwood basketball courts (plus four more on site) configurable for 12 volleyball courts (plus five more on site). The Rock includes three team rooms, an event planner workspace, message boards, bleacher seating and Champ’s Grill for on-site dining. Rocky Top Sports World hosts premier youth and amateur events, camps, special events and tournaments. Past events have included the Gatlinburg Labor Day Soccer Invitational tournament and Tennessee Miracle Basketball tournament in May. Rocky Top will also host the AAU 2018 5th Grade Girls National Basketball Championship. Economic goals were set at $10 million in the first year of operation; Rocky Top Sports World officials report a $17.5-million impact since opening. The venue has produced 44 multi-day events, surpassing targets by 69 percent. The $7-million complex was funded primarily through donations from community leaders, corporate donors and individuals from the general public. The land was sold through local county government at a substantial discount. The complex features eight fields in two quads with more than 400 parking spaces. Quad A includes one 385-foot and one 350-foot field, both fenced with skinned infields, and a 385-foot fenced field with a grass infield and stationary mound. Quad A also features a Miracle Field, which is used by players with disabilities, as well as covered dugouts, restrooms, concessions and bleacher seating with 100 seats per side of each field. Quad B includes four 300-foot fenced fields with skinned infields, portable mounds and covered dugouts. Each field has bleacher seating for 100 per side and there is a restroom and concessions building. The Championship Field is a 385-foot, fenced, lighted field with grass infields and stationary mounds, along with covered dugouts and grandstand seating for 1,000. Phase II, when complete, will add a third quad (Quad C), which will be similar to Quad B, and warm-up areas, parking for an additional 400 cars, a championship softball field and youth baseball fields with fence distances of 225 feet. Top events in 2015 were NAIA – WHAC Softball Championships, USSA Global World Series and GameDay USA National Championships. Art Van Sports Complex’s first full year of tournaments exceeded expectations with 18 tournaments, which generated more than 650 teams; 8,000 participants (plus more than 20,000 family members); nearly 8,000 hotel room nights and an estimated economic impact of $3 million. The $12.5-million Myrtle Beach Sports Center was financed through local government bonds; initial funding came as a part of a state grant. The 100,000-square-foot Myrtle Beach Sports Center is configurable for eight basketball courts or 16 volleyball courts spread over 72,000 square feet of column-free space. Other amenities include Wi-Fi, a 12-screen video wall, meeting rooms, seven team rooms, telescopic bleachers, a private mezzanine for elevated viewing and a café with indoor and outdoor seating. Its top events were Varsity Cheer-Spirit Sports, which takes place in the spring every year, Big Shots NCAA Certified Basketball and NTBA Boys National Championship, both occurring in the summer. Each event generated more than $2 million of economic impact and collectively accounted for over $200,000 in direct revenue for the Myrtle Beach Sports Center. Myrtle Beach Sports Center has generated over $12 million of economic impact to Myrtle Beach and the Grand Strand Area. This number has surpassed the first year goal of $10 million of economic impact in five months of operation. Additionally, the facility has operated on the positive side of the balance sheet for its first five months. The center has seen 27,635 participants (coaches and players), and has sold 62,487 event day tickets (a combination of event passes and one-day tickets to spectators). Game changing facilities generating staggering economic impacts. Here's the lineup of what Sports Planning Guide has officially coined as megacilities.